Padmasambhava is also referred to as the Second Buddha as he’s so important for assisting in the founding of Tibetan Buddhism in Tibet. It is because of his activity that the Dharma was firmly established in the ‘roof of the world’. 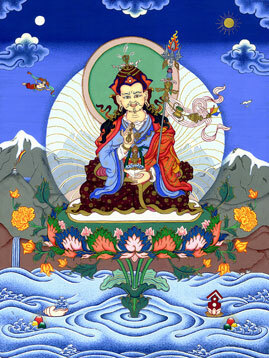 Padmasambhava was born in India in the 8th century (from a lotus flower as the story goes), and he was a tantric master and famous for performing miracles. The Tibetan king at the time, King Trisong Detsen, was a buddhist practitioner and he invited Padmasambhava to help establish Buddhism in Tibet, as there were many obstacles to do so. Through his awesome mastery of tantric practices, he is said to have transformed the negative spirits -that prevented Buddhism from flourishing- into protectors and guardians of the Buddhist Dharma. In Tibet Padmasambhava was called Guru Rinpoche, and his powerful presence in the country helped built Samye, the first Buddhist monastery in Tibet. Padmasambhava also introduced a style of monastic life that included Cham Lama Dances, which united tantric meditation and dance. Guru Rinpoche is also famous for hiding numerous termas or ‘treasure texts’, that have secured the Vajrayana teachings for the future centuries and that were and still are revealed when needed. Also one can still find the hand and footprints of this special, half-wrathful figure in the many caves throughout the Himalaya that he used for meditation. 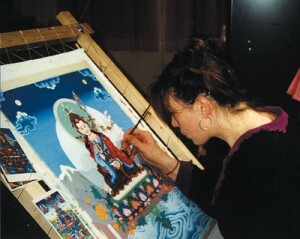 This is a picture of the process of this thangka. The painting is made with the finest brushes and is full of small details.